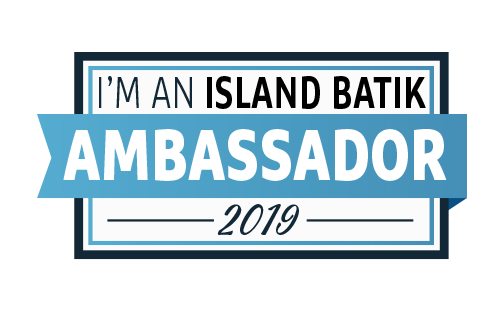 The Island Batiks Ambassadors “Great Outdoors” Blog Hop is into it’s second week, and today, Amy Warner of Sew Incredibly Crazy and I get to unwrap our “Surprise” packages and show you what we made with Island Batik’s brand new “Safari” line. We each received a half yard of each of the fabrics in this collection, plus larger pieces of two coordinates. My coordinates were the giraffe print in the upper right of the photo, and the bright yellow in the lower right. I can’t wait to see what Amy made with hers. I came up with a sampler quilt that used some of every fabric I received. The Safari Sampler features seven pattern rows named (top to bottom): Gemstones, Equator, Sundown, Tropic of Capricorn, Daybreak, Tropic of Cancer, and Trouble. Each row finishes 48″ wide. I added 4″ (finished) side borders, for a generous lap-size quilt that finishes 56″ x 72″. If your local quilt shop doesn’t carry the Safari collection from Island Batik, a few of my favourite online sources are the Missouri Star Quilt Co, Hancock’s of Paducah, and Fabric Shack. When making my sampler, I used the Tucker Trimmer® and Split Rects® trimming tools from Studio 180 Design. Thank you to Island Batik for providing the fabrics for this sampler, to Aurifil for providing the thread. I am falling in love with their 50wt cottons for piecing. I have actually sewn most of my IB projects this year with this one spool of off-white Aurifil 50wt thread! I bought this one, but Hobbs has been very generous in providing batting for the Island Batik Ambassadors. And thanks to Hobbs for providing the battings we are using in our projects this year. In lieu of a prize drawing, I’ve decided to make the Safari Sampler pattern a free download, so everyone wins!